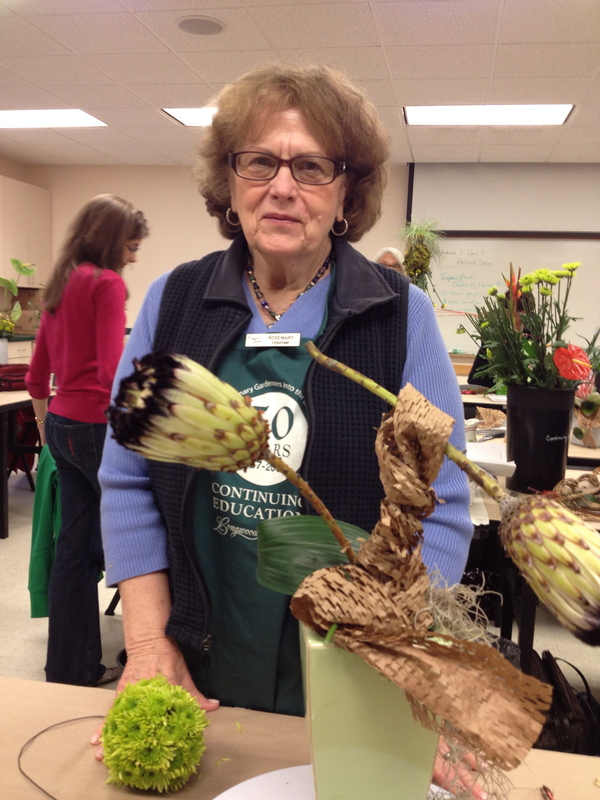 There is a lot of oohing and ahhing at the beginning of today’s class, for the counter is covered in a array of bright tropical flowers and lush foliage, the likes of which many of us have never seen before. These are for us! To use! In an abstract design! 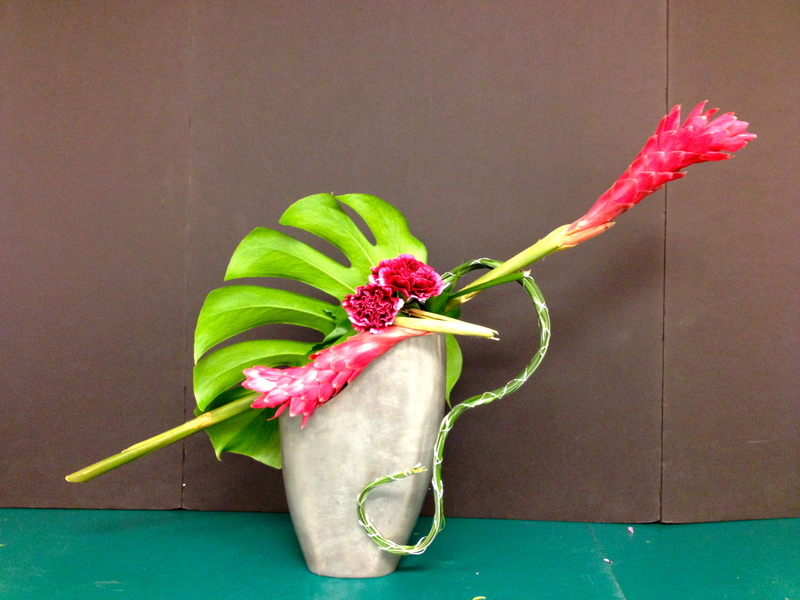 Tropical flowers work great in modern and abstract designs. 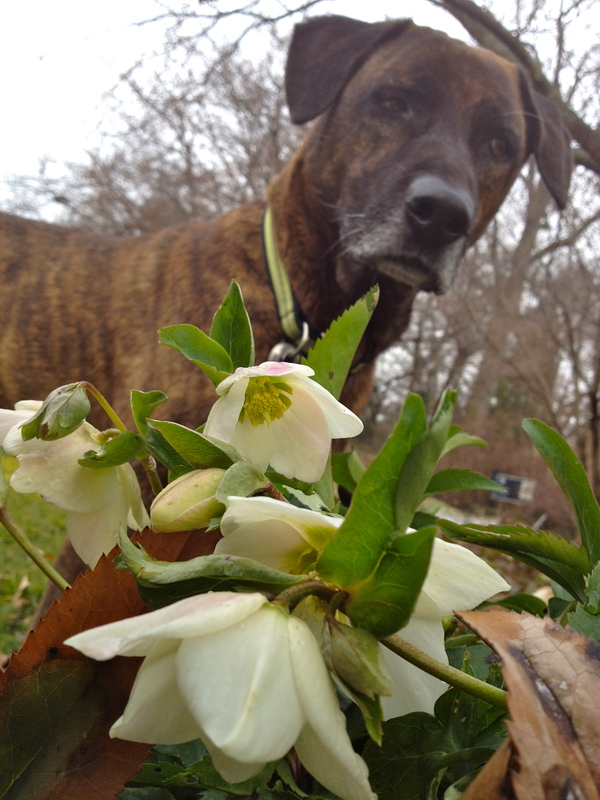 But they do require special care – remember, they’re from a warmer, more humid environment and often cannot survive in a cold climate or standard floral refrigerator. 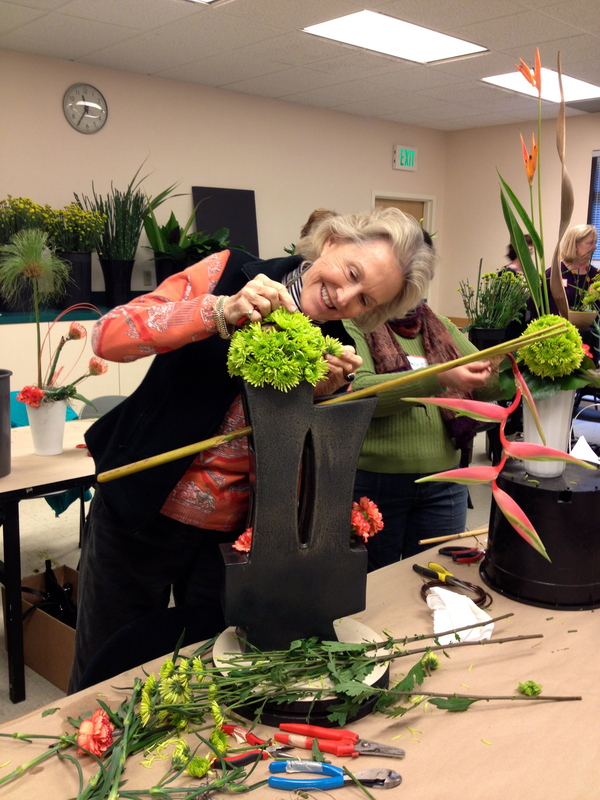 Use room temperature water when working with tropicals – most love to be misted on a daily basis! 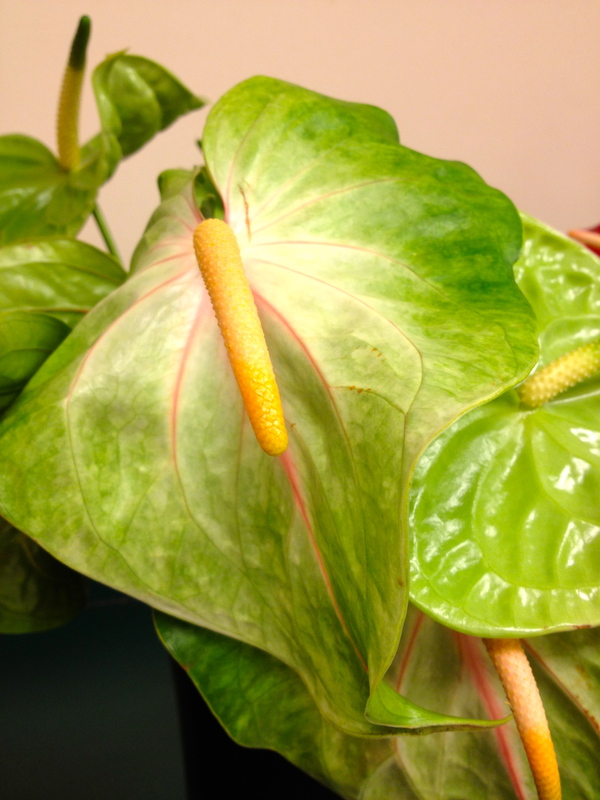 Anthurium – called Flamingoblumen in German- come in many shades and sizes, and because they drink from that pointy thing or spadex, they should be submerged under fresh water for 10-20 minutes before using them, and misted daily in an arrangement. 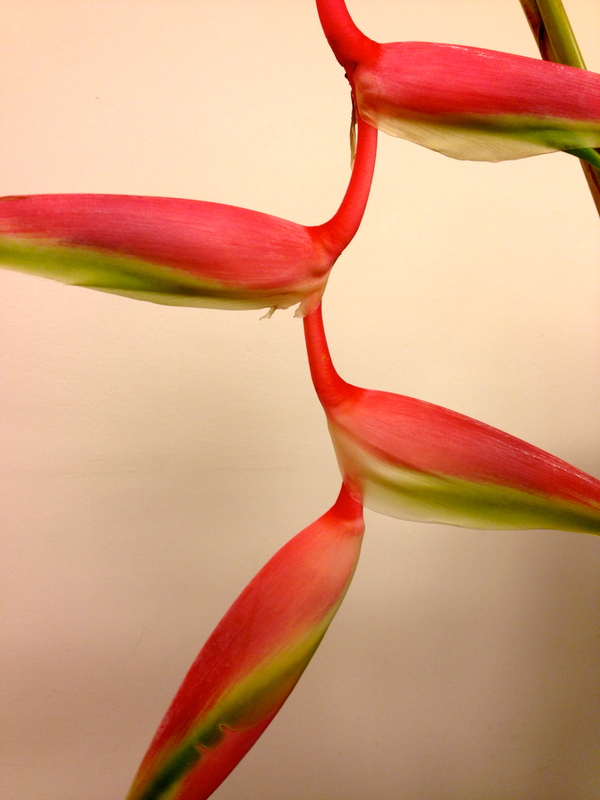 Jane's design - the tops are not chopped, off that's how Heliconia really are! Then we talked about Abstraction, which in the art world indicates a departure from reality. This departure from accurate representation can be only slight, or it can be partial, or it can be complete. 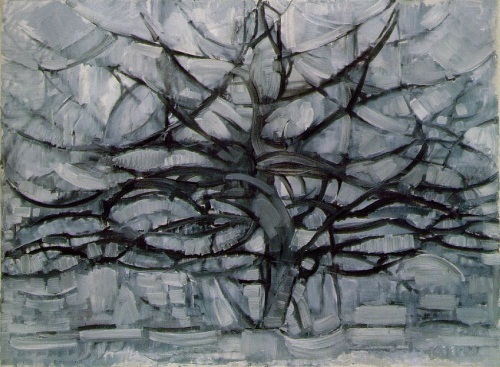 Jane brought up the Tree series by Piet Mondrian as an example of varying degrees of abstraction. Piet Mondrian, Avond (Evening), Red Tree, 1908. Collection of Gemeentemuseum, The Hague. 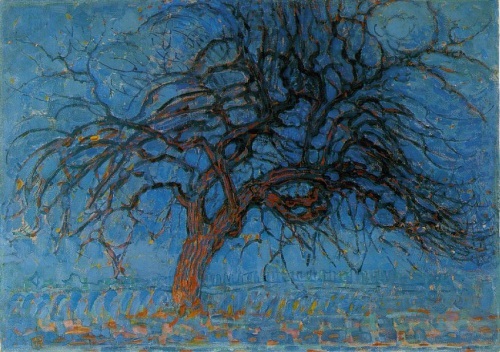 Piet Mondrian, Gray Tree, 1911. Collection of Gemeentemuseum, The Hague. 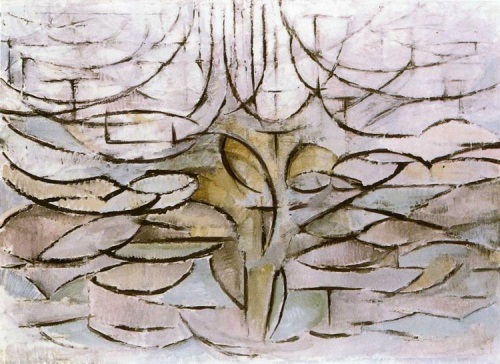 Piet Mondrian, Flowering Apple Tree, 1912. Collection of Gemeentemuseum, The Hague. And the RESTRAINT award goes to....Jenny! This design was probably one of my favorites today. 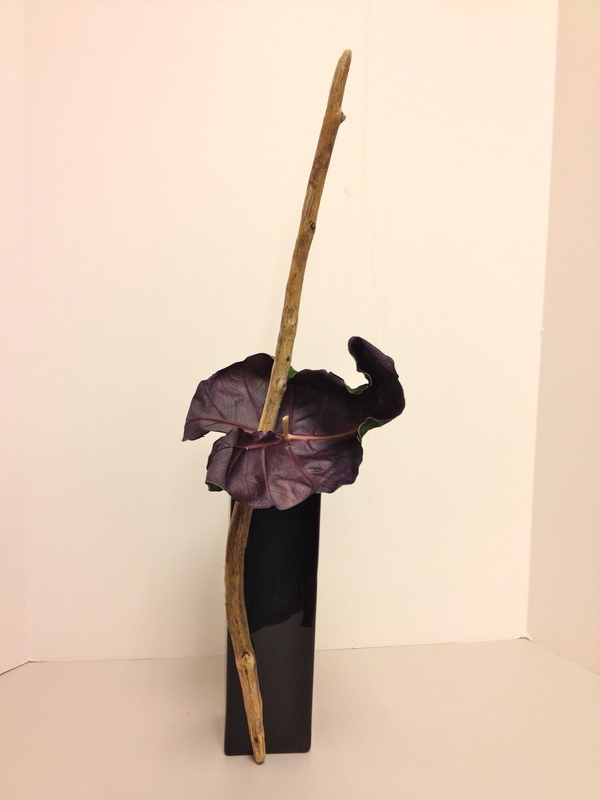 One colocasia leaf, one driftwood stick, one black container. Some glue. Gorgeous. I'm breathless. 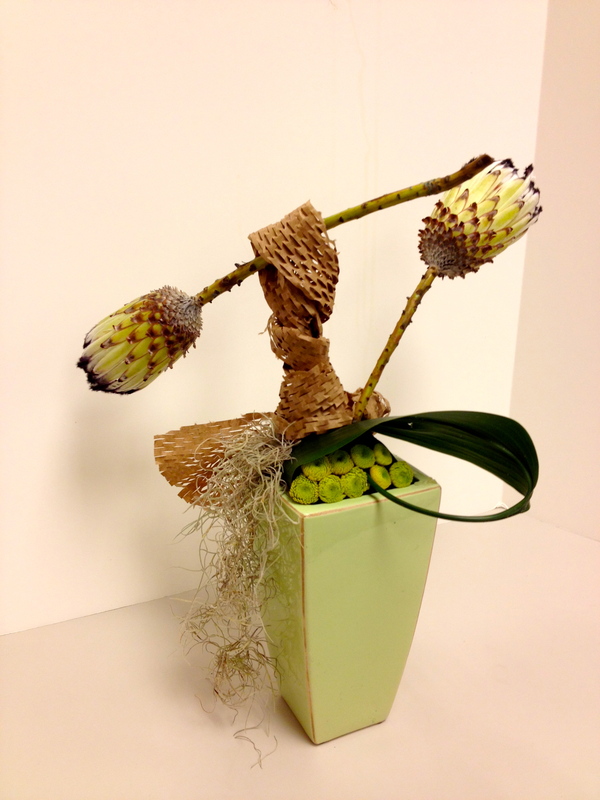 Jean's design uses heliconia, carnation, and monstera leaf, plus bear grass bundled together with silver wire. It's like that CONTAINER would be lost without exactly what's inside it. Weren't you wondering what someone would do with the 'Chocolate Balls?' 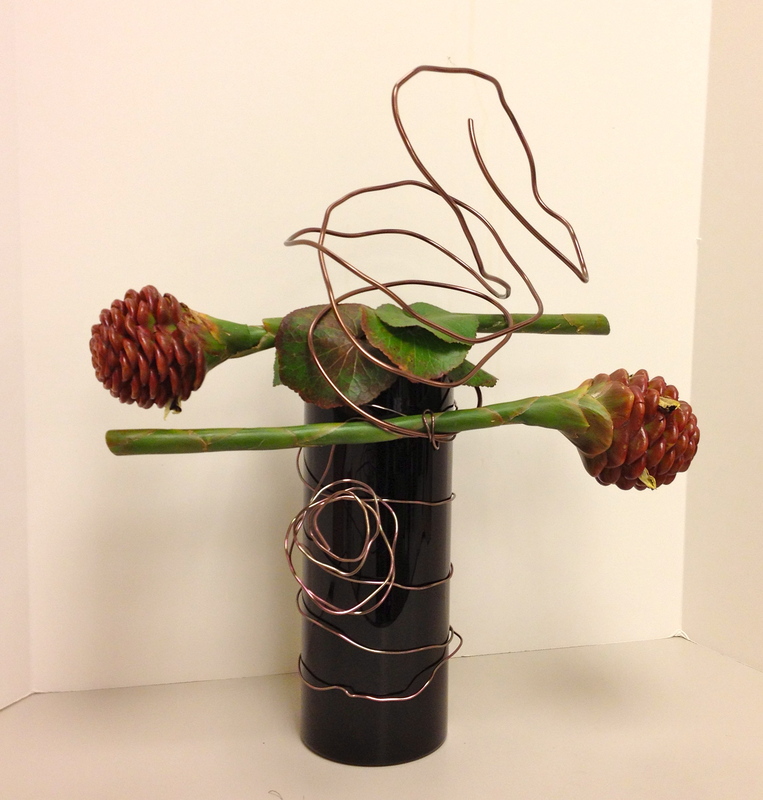 Here Parul schools us in abstract design! 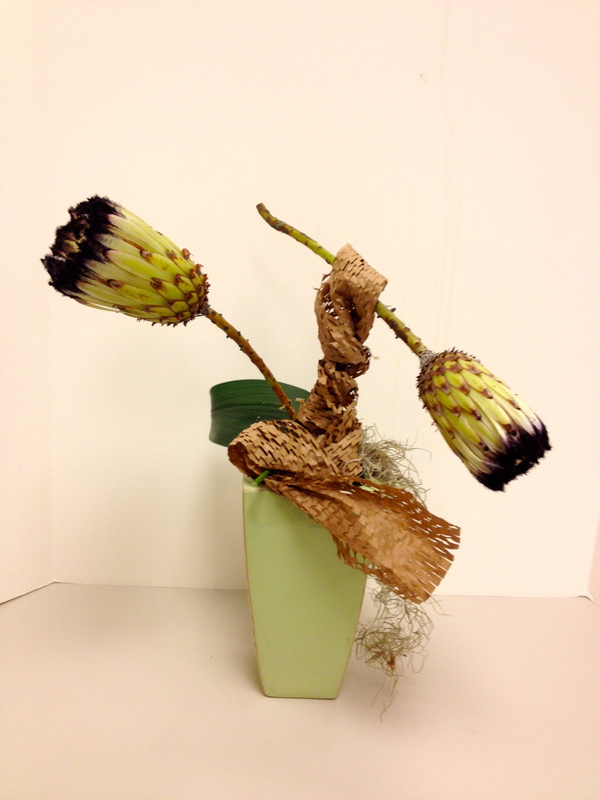 Talk about NON NATURALISTIC use of plant material! Rosemary the volunteer helps out with some words of encouragement. For my design, I used the two Protea ‘Van Rooys White’ which I had been eyeing from the beginning of class since they matched the container I brought so perfectly. In these Advanced classes, it’s BYOC! 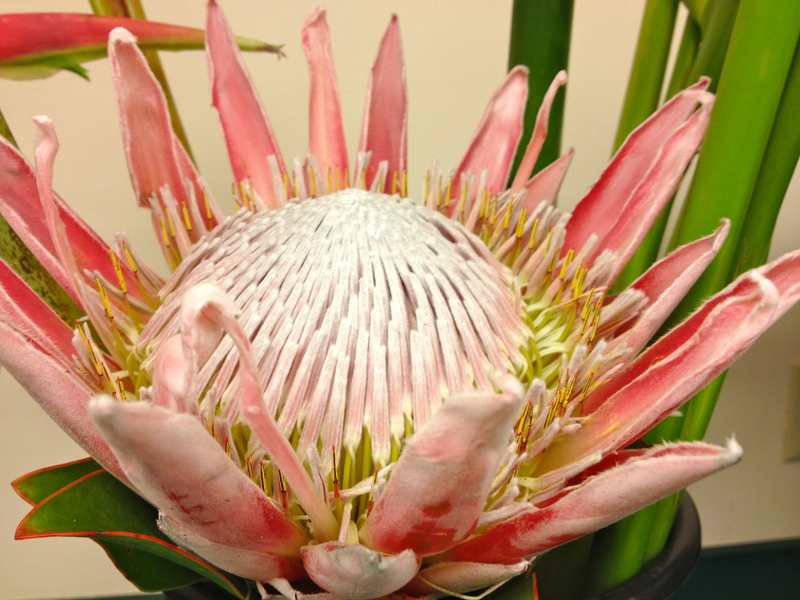 There are many many Protea species, South African flowering plants that I would love to see growing in the wild. 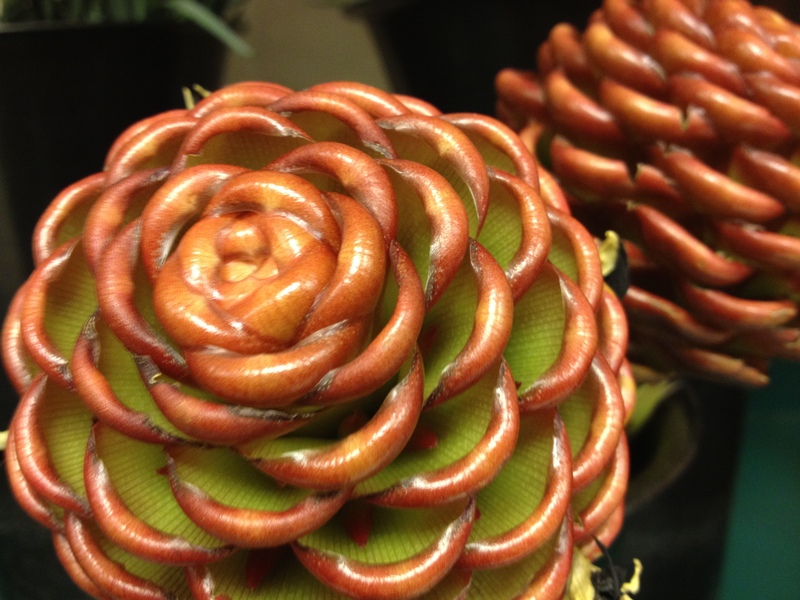 In fact, Protea was named for the god Proteus, who could change his form at will – because Proteas have such variety of form. Tim Snyder, a graduate of the Professional Gardener program at Longwood, now gainfully employed at Chanticleer, recently visited South Africa with a group of students. Here’s a really cute video with great music that Tim and his wife made of his trip — keep your eyes peeled for Pincushion Protea growing in the wild! I wanted to do something playful with one of them hanging in space unrealistically. 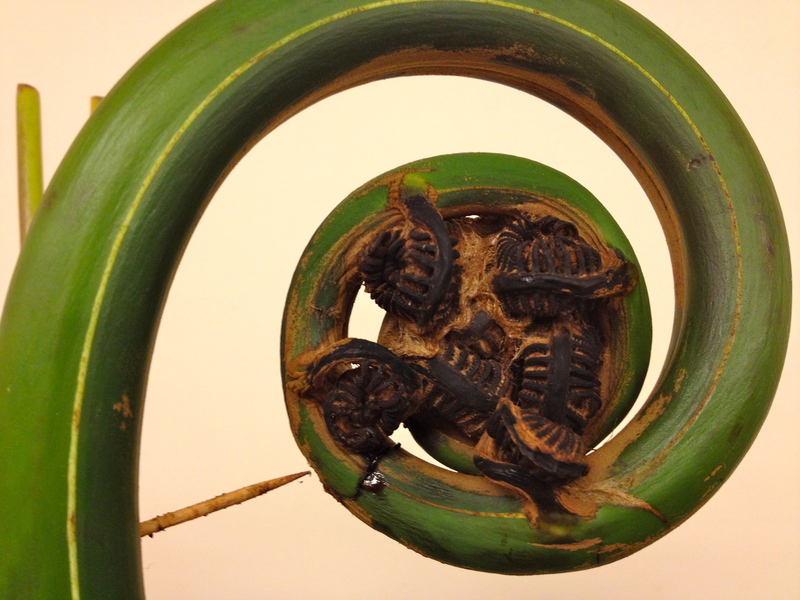 You have to think long and hard about how to have more than one point of emergence, and this seemed like an easy way to achieve that. 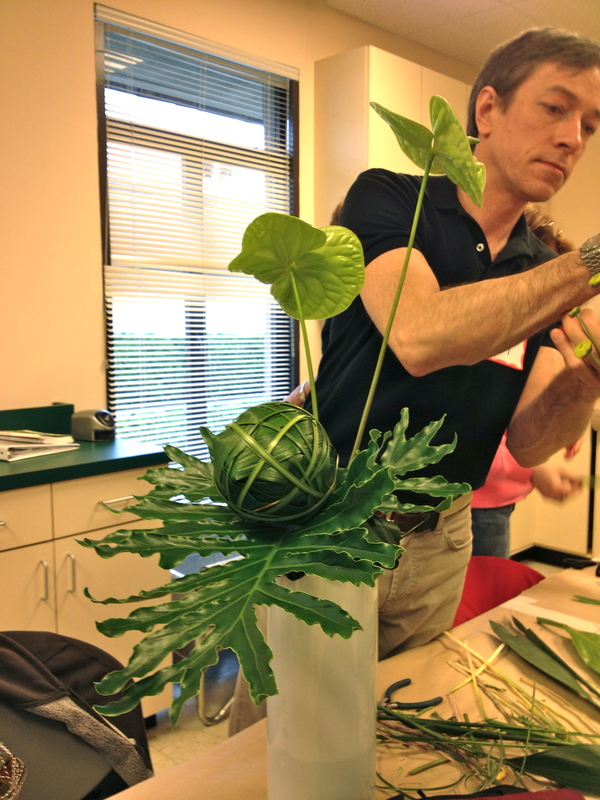 I wired the stem using fairly heavy wire, sticking it into the floral foam inside the container. Then I covered the wiring mechanic with brown paper packing material. The apidistra leaf stem pokes right through and with the remaining space I poked in a few yellow pom pom mums to peek out. 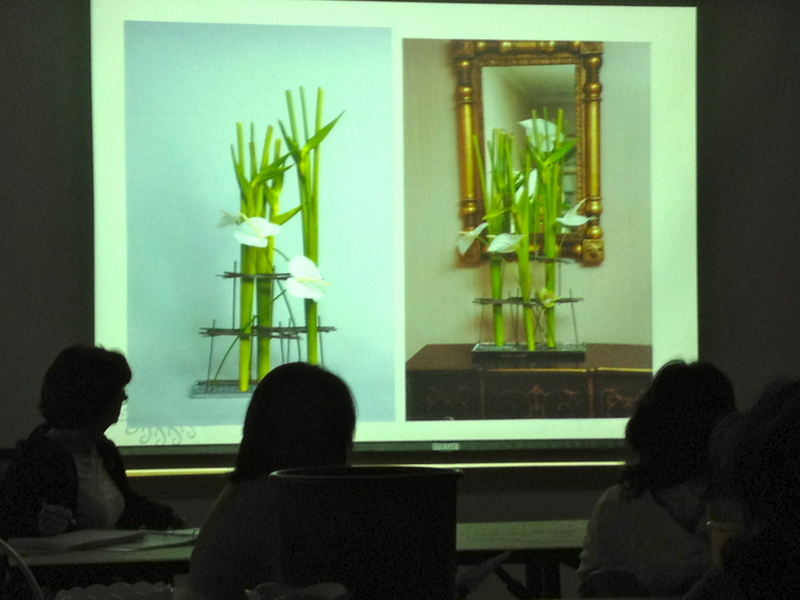 This class was totally mind-bending. 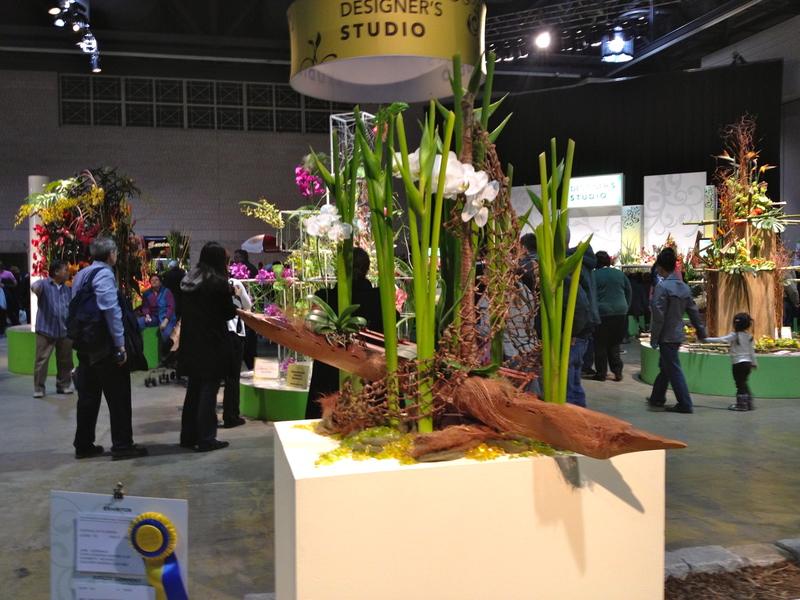 It really makes you throw away a lot of the rules to see that anything’s possible in the world of floral design!